I conducted a field research on the M group chimpanzees at the Mahale Mountains National Park, Tanzania, from February to March 2012. The aim of thisstudy is to collect data on the following so-called 'cultural' behaviors among wild chimpanzees: ant-fishing, a tool-using behavior for feeding on arboreal carpenter ants; pant-grunt, a greeting behavior frequently observed in the situation of encounter; leaf-clipping, a courtship display mainly exhibited by adult and adolescent males. 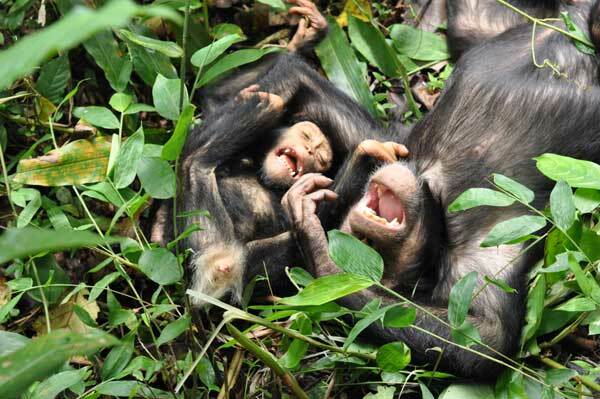 I observed chimpanzees using ad lib sampling and focal animal sampling concomitantly and mainly focused on the social interactions among adult males and other members of the group. Preliminary analyses illustrate that the mode of the social interactions among adult males and estrous females shares characteristics in common with that of among mothers and infants which I studied previously. 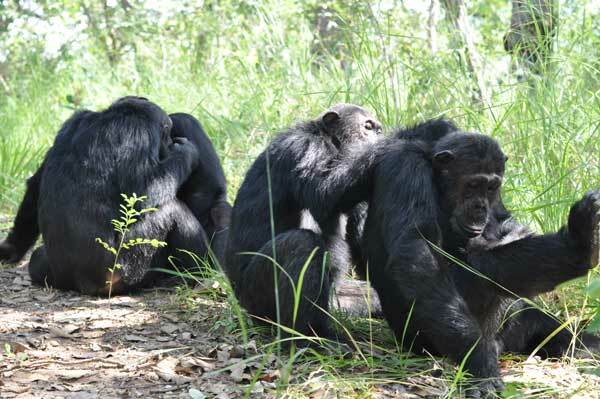 Further analyses will be needed to illustrate these qualitative characteristics of social interactions which construct (and are constructed in) the sociality of wild chimpanzees. The existing alpha male grooming an ex-alpha male.